Autumn is almost here! Stores are beginning to carry Pumpkin scented candles, Starbucks is selling Pumpkin Spice Lattes, and you can see a hint of change on the leaves. In true Macy fashion I jumped the gun a bit and already hung my autumn wreath. This wreath looks super-expensive but I made it for less than $5! I already had the wreath form, but it is only $3.50 in the floral department at Walmart. I also got the little scarecrow from Walmart for $1. 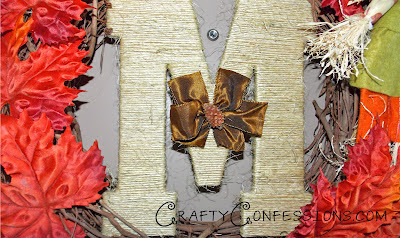 I got the 'M' for $.79 on clearance at Michaels, and the big leaves were 50% at JoAnn so they only cost $2. I already had the jute on hand, but I purchased it from Honk's for $1. I placed the leaves and scarecrow on the form where I wanted them by weaving the stems. 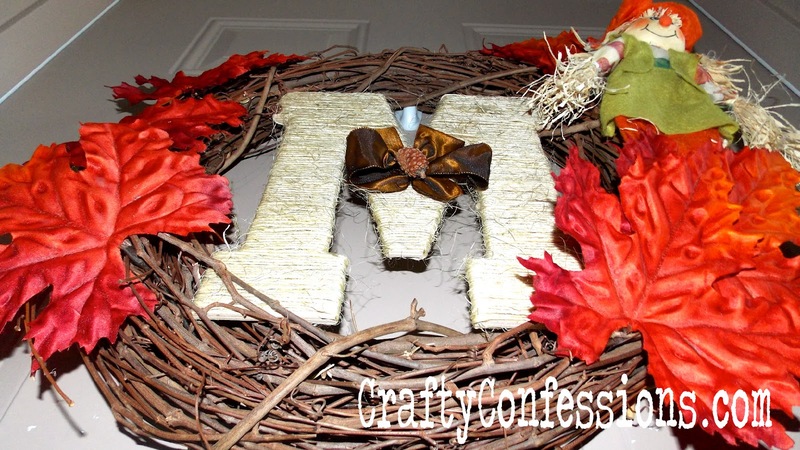 I try not to hot glue my wreath form so I can use it for the next season. 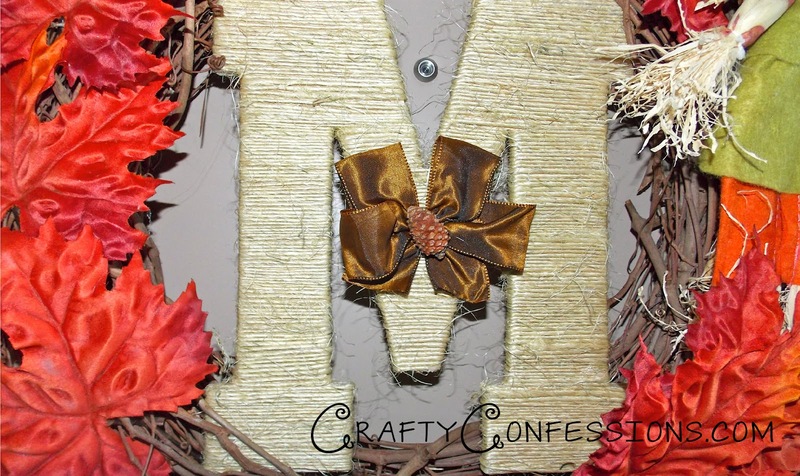 The time consuming part of this wreath was wrapping the M with jute. My poor fingers got hot glue and jute stuck to them, but it was nothing my home-made sugar scrub couldn't get out. After it was wrapped I embellished it with a bow and itty-bitty pine cone, and secured it to the wreath. 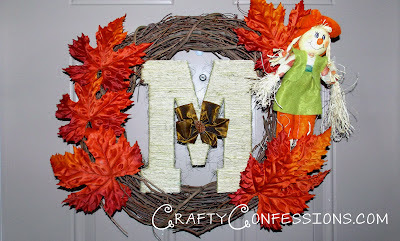 I love how classy and inviting this wreath is, and it is the perfect way to usher in my very favorite season. Any time questioned concerning the sort of array that is available inside stone cartier replica sale, the particular spokesperson for your web store answered, We've many things for our rolex replica to pick from. Right from stone wedding jewelry to be able to stone eternity jewelry to be able to stone stud bracelets to be able to stone mixture band, we've them. As well as supplying several types of diamond jewelry, the particular breitling replica uk even offers to adopt the program to the next stage simply by supplying custom made diamond jewelry option to the consumers. In the event the unique sort of something just isn't outlined one specific, Amazing Stone can custom made help make the particular bit as per the particular requirements offered. The particular retailer presents the consumers an unbelievable collection of gemstones which can be hublot replica normal. As well as gemstones, there is certainly gemstone diamond jewelry also. There exists a reward document alternative also which the consumers can easily utilize to be able to reward their loved ones. Shipping and delivery will be totally free regarding requests which can be previously mentioned $100. Another highlight is diamond jewelry which is about Clearance selling giving the ability for the customers to be able to clinch with desirable rates. The particular retailer promises to offer diamond jewelry which is to be perfect for almost any a celebration. The particular spokesperson regarding hublot replica sale, claims the complete staff is quite very pleased with human eye customer feedback for your loom group timepieces system.